Over time, a building’s foundation will naturally settle (move downward) into the soil underneath it. Too much settlement can cause foundation problems such as cracking. When cracking occurs from settlement, it can weaken the building’s structure. Settlement causes different types of foundation cracks, including vertical, horizontal, diagonal and step. 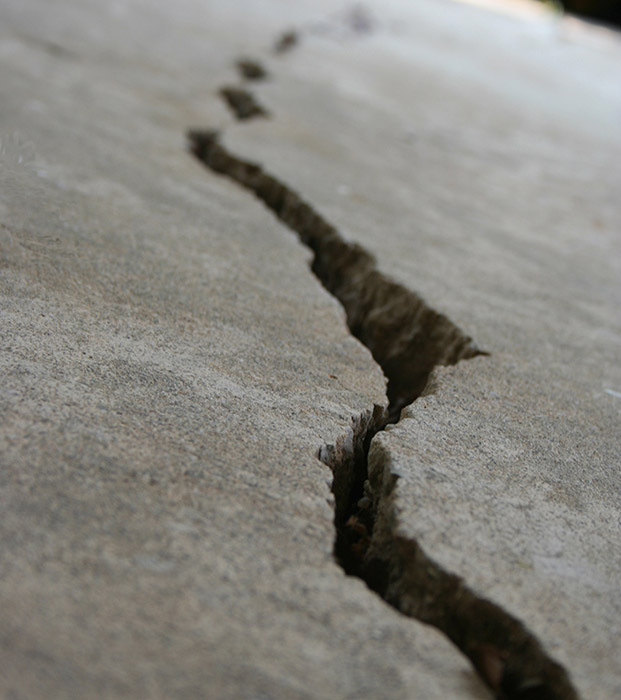 The cracking is different than shrinkage cracks, which occur when poured concrete begins to cure. Excessive settling can result when a building has been improperly constructed, built on poorly compacted soil, or there are frequent changes to the soil’s moisture content. Water can have a big impact on the soil under a foundation. When the soil becomes wet from rain, sprinklers or water leaks, it will expand and push at the foundation. As the soil starts to dry, it will contract.. As the volume of soil decreases, the foundation will sink into the empty spaces. The same thing can happen when the moisture in soil is absorbed by the roots of trees and foliage planted near the structure. Substantial or uneven settlement will put stress on the foundation. The stress will eventually cause cracks to appear. Cracks not only weaken the foundation, they allow water to seep further into the structure. Foundation cracks can be repaired in many different ways. A common solution is to fill the cracks with a substance that creates a waterproof seal. If you find cracks in your foundation, ask a foundation repair expert to inspect your property. Some types of cracking, such as lateral displacement cracks, are more serious than others and will need to be addressed by an expert. A foundation repair professional will also be able to tell you what is causing the problem so that it can be addressed as well. Most importantly, never ignore foundation cracks. Get them fixed as soon as possible to prevent more serious foundation damage. Julian De La Torre, expert in Los Angeles foundation inspection, repair & house bolting (Los Angeles) and founder of Julian Construction (www.julianconstruction.com) in Los Angeles, has inspected over 15,000 structures, working with engineering firms & local departments of building & safety. The company has done more home foundation repair (Los Angeles) than any other company in the area over the last five years. Julian Construction owns its own company and is a “no middlemen” model–no salesmen or subcontractors–you get the principals of the company & its workers under your home.